Over $100 billion in Iranian assets are unfrozen. UAE, Germany and the U.K. are the favored investment destinations. In Iran, there are 32,000 high-net-worth individuals, and 400 Iranians are worth over $30 million. Sanctions on Iran imposed by Europe and the U.S. that curbed exports and financial transactions have finally been lifted. These sweeping unilateral rulings punished ordinary people and, in particular, made it difficult to get visas or open accounts with banks in the European Union (EU) and America. However, now, with frozen assets of over $100 billion to be released and new revenue from oil, wealthy Iranians are expected to make their debut on the international property scene. According to Tranio expert Yulia Kozhevnikova, two regions will benefit from their custom: the Middle East and Europe. The UAE and Turkey are still favored by Iranians due to their geographic proximity and well-established cultural ties. Now that the sanctions have been lifted, Iranian business people will open more offices in Dubai as well as upmarket properties in the UAE and Turkish resorts. Iran has well-established ties with the UAE: the three emirates of Abu Dhabi, Sharjah and Dubai have the second highest trade turnover with Iran after China. According to Forbes, there are 9,500 companies and 375,000 Iranian citizens living in the UAE, half of which are in Dubai. There are 9,500 companies and 375,000 Iranian citizens living in the UAE. This destination is expected to benefit massively from these new investors who will be opening offices as they did before the sanctions. Burj Khalifa image via Shutterstock. According to the Dubai Land Department, Iranians were the fourth largest non-Arab community of property investors in 2015, outnumbered only by Indian, British and Pakistani buyers; 1,850 Iranian citizens invested AED 4.6 billion (approximately $1.2 billion) in Dubai’s real estate last year. Between 2010 and 2015, their number dropped from 12 percent to 3 percent, but experts are confident that the political reset will reboot growth. Dubai has great attraction potential thanks to falling prices. 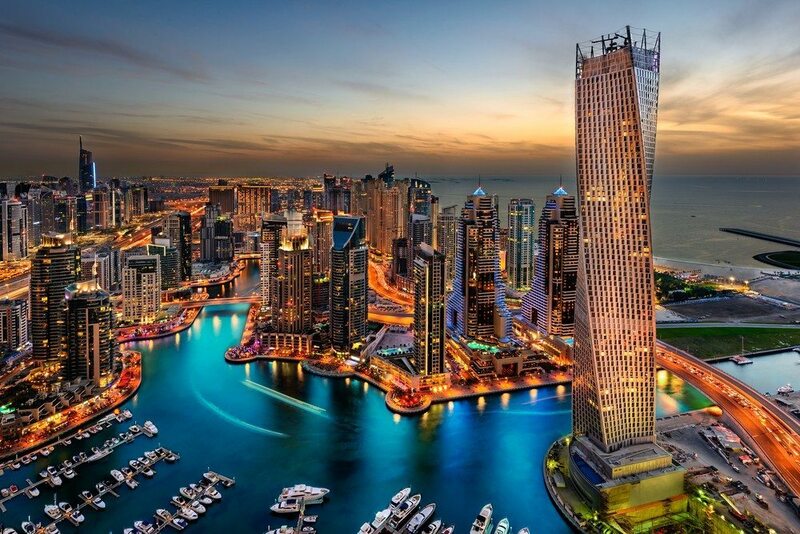 According to the Dubai-based consultancy company Phidar Advisory, property prices in 2015 went down by 1.3 percent. Another real estate services company, Cluttons, expects them to drop another 3 percent to 5 percent in 2016. Iranians also go to Turkey where they have been authorized to buy real estate since 2012. However, property acquisitions still need to be approved by the Foreign Affairs Department of Turkey. Iranians also go to Turkey where they have been able to buy RE since 2012. According to TurkStat, Turkey’s Statistics Institute, Iranians bought 744 properties in 2015 and were the eighth most active foreign buyers after citizens of Iraq, Saudi Arabia, Kuwait, Russia, the U.K., Germany and Azerbaijan. The U.K. and Germany are the most popular European destinations for Iranian investors and should see increased activity on both their residential and commercial property markets. Due to a certain amount of political risk at home and in the Middle East, which could speedily annihilate international relations, Iranians are looking for ways to diversify their investment portfolio and protect their capital using markets outside the Middle East. For this reason, the U.K. and Germany are especially popular because they are considered reliable and least exposed to a violent downturn. Citizens of Iran obtain 18,000 to 20,000 residence permits annually in the EU, and over 40 percent of these are issued in Germany and the U.K., according to Eurostat. London is expected to see the most inbound investments. Estimates by real estate agency Rokstone say that the number of Iranian real estate buyers could increase by 25 percent by the end of 2016. Babak Emamian, head of the British-Iranian Business Association, says about 1,000 Iranian high-net-worth individuals, 50 of which have over £100 million, are considering investing in the U.K., as reported by Property Week. In fact, their investments into U.K. residential and commercial property could hit £5 billion over the next decade according to Re/Max Property Group. Iranians are likely to focus on acquiring turn-key properties and financing new developments. The boroughs to benefit are those districts that they used to favor in the ’60s and ’70s, such as Mayfair, Knightsbridge, St John’s Wood and South Kensington. High-end property in surrounding counties such as Buckinghamshire, Berkshire, Kent, Sussex, Hertfordshire and Essex will also get attention. According to Cluttons, the average budget is £2-5 million per property in London. Real estate in Germany has been a popular destination for Iranians in previous decades. There are currently about 100,000 to 120,000 Iranians in Germany, making it the largest community in Europe (compared to 80,000 in the U.K.). Hamburg alone is home to up to 25,000. There are currently about 100,000–120,000 Iranians in Germany. Now that the sanctions have been lifted, Iran’s GDP is expected to grow and unemployment to fall. Rising household incomes should boost foreign real estate sales, too. According to Knight Frank, the number of Iranians earning over $30 million increased 237 percent between 2004 and 2014 and is expected to go up by another 76 percent by 2024 to include over 400 people. Currently, there are about 32,000 Iranians earning over $1 million, which is three times as much as in 2000.